← Thinking about starting your own business? Whether we’re talking about business, or about relationships, or about life in general – there are going to be times when we get things wrong. That’s only human …. But it is how we recover and whether we keep moving forward that becomes a measure of our character. It is about having the humility to step back, take a deep breath and ADMIT WE WERE WRONG …… Then, if necessary, apologise and make restitution to any other people who may have been affected by our mistake. But, then what? Do we see new sights, smell new fragrances, enjoy new and uplifting scenes by walking down the same comfortable path as always? Do we get to meet new people who will challenge us, who will teach us and maybe inspire us to become more than who we are today? When we open ourselves up to new experiences, there will always be some risk. And that means the chance of making a mistake and things not working out the way we might have planned. Have no fear of making a mistake! But if we live our life based upon a fear of making a mistake – then chances are that today will be like yesterday, and that day will have been like the one before. The only way that we can live to reach our true potential is to be willing to go out and try new things. We can learn, grow and become wiser from any mistake that we make – as long as we can swallow our pride and recognise that what we’ve been doing just isn’t working. Let us become more child-like. Children have great perseverance. Have you seen a young child learning to walk? …. They stumble and fall over – then what do they do? 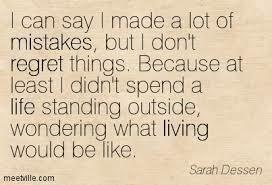 ….. Do they say, “Oh, I made a mistake – that’s terrible. 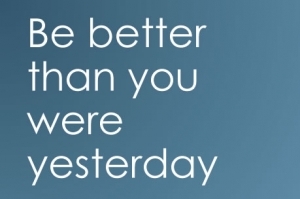 I’d better not try that again because I’ll never be able to get that right”? Nope – they keep at it. No fear of making a mistake paralyses them from trying again Each time they try, they learn something new about balance. You had perseverance and the courage to be less than perfect when you were a child – so why not try to re-connect with those innate qualities again. Have no fear of making a mistake …… just try not to make the same one twice! Remember, growth and self-discovery begin at the end of your comfort zone. And when you do make a mistake – congratulate yourself if you have been bold enough to have at least tried something new and different. 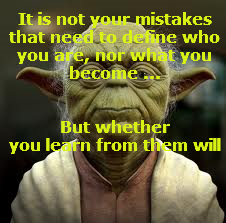 This entry was posted in personal development, self-improvement and tagged fear of mistakes, learning from mistakes. Bookmark the permalink.